Oats vegetable soup is one of the most easiest way of getting oats into your daily diet. It is simple to make with very few ingredients and can be served as a healthy meal with a slice of bread or as a satisfying appetiser. 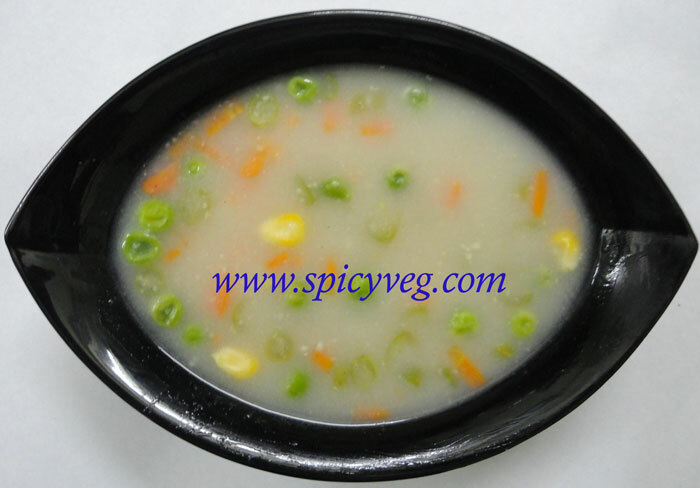 This soup is suited for people of all ages and for ailing patients.An easy recipe for healthy Oats Vegetable Soup, involves cooking chopped Vegetables with Oats and taste-enhancing Pepper . 1.Grind the oats to a fine powder. 2. Heat oil in a pan and saute the vegetables and garlic till they begin to sweat. 3. Now add the oats powder and fry along with it for 2 minutes. 4. Add salt and water and let it come to a boil. 5. Now add the milk and pepper powder to it and bring to a boil. 6. Garnish the rich and creamy oats soup with cilantro or green onions. Serve piping hot with a slice of bread. Note: You can increase /decrease the quantity of oats according to the thickeness you want for the soup.